-Net Merit is a powerfully made very complete bull that will be known for his females. -We feel that he has the potential to be one of the best female makers in the breed. -His Dam of Distinction mother has a great one every year with an average WW ratio of 107.8 on 6 natural calves. 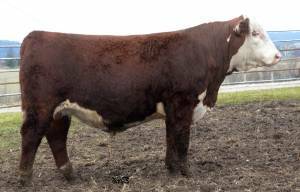 -Net Merit was the high selling bull in our 2015 sale to Mead Farms, Barnett, MO.